Titanium UNS R50400 Threaded Adapter Exporter in Africa, DIN 3.7035 Threaded Fittings in Tanzania, Titanium Grade 2 Socket weld Fittings Manufacturer in India. 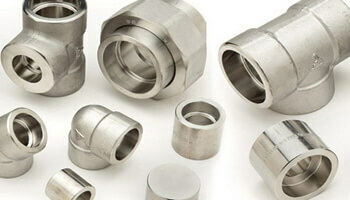 Sangeeta Metal is one of the leading Manufacturer, Supplier and Exporter of Titanium Grade 2 Forged Fittings that are actually manufactured from High Quality of Standard Raw Materials and are designed as per with national and international standards. Grade 2 Titanium Forged Fittings is available in a wide range of sizes and is commonly used for titanium pipe, hardware and fittings. UNS R50400 Forged Fittings machining possesses similar characteristics to austenitic stainless steel. Meanwhile, hot forming of these Din 3.7035 Forged Fittings will reduce its spring-back force while increasing its ductility. We offer these Titanium Grade 2 products in custom-made shapes and sizes as per the requirements given by our clients, and that too at an affordable and market leading prices. ASTM B381 Titanium Grade 2 Forged Threaded Bushing Dealer in Zambia, Titanium Gr 2 Socket Weld Cap in Nigeria, Titanium Alloy Gr 2 Bull Plug Supplier in South Africa.